Revenue in the ePapers segment amounts to US$1,534m in 2019. Revenue is expected to show an annual growth rate (CAGR 2019-2023) of 7.5%, resulting in a market volume of US$2,051m by 2023. User penetration is 6.1% in 2019 and is expected to hit 7.0% by 2023. The average revenue per user (ARPU) currently amounts to US$33.46. In global comparison, most revenue is generated in United States (US$2,077m in 2019). An ePaper is a digital replica of a printed daily or weekly newspaper. ePapers can be accessed through various devices such as specific eReaders (e.g. Kindle), tablets, smartphones or computers. ePapers are typically purchased as subscriptions, but can also be downloaded as single editions. The following are not covered in the definition of an ePaper: digital paid content on websites of newspapers (non-replica) and printed newspapers or bundled newspaper subscriptions with digital editions as a free extra. 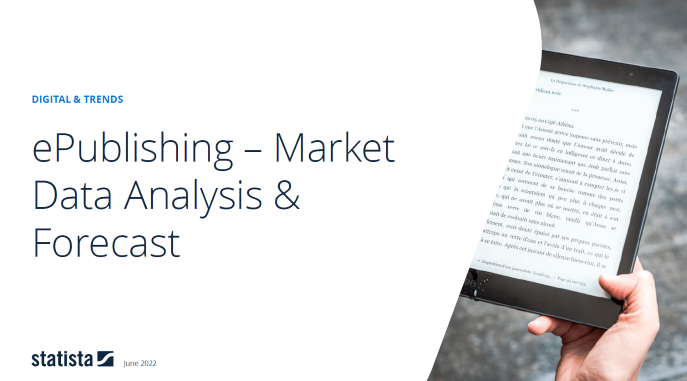 Reading Support Revenue in the ePapers segment amounts to US$1,534m in 2019. Reading Support The ePapers segment is expected to show a revenue growth of 9.5% in 2020. Reading Support In the ePapers segment, the number of users is expected to amount to 53.2m by 2023. Reading Support User penetration in the ePapers segment is at 6.1% in 2019. Reading Support The average revenue per user (ARPU) in the ePapers segment amounts to US$33.46 in 2019. Reading Support With a market volume of US$2,077m in 2019, most revenue is generated in United States. Reading Support With a rate of 15.0%, the user penetration in the ePapers segment is highest in Japan. Here you can find more studies and statistics about "ePapers".